Pvt. Elijah H. Guy was born the fifth child of Lloyd and Margaret Guy on March 11, 1840 on a farm in Meigs Township, Muskingum County, Ohio; a free man. At age 22, he married Rebecca H. Norman on October 31, 1862. In 1862 Elijah purchased a 40 acre farm in Bushnell Twp., Montcalm County, from his oldest brother Moses. His parents and siblings had moved from Ohio to Sodus Twp., Berrien County, Michigan in the late 1850's. They later purchased several acres of farmland in Bushnell in 1862 and became the first black family in the area. Elijah and Rebecca's only son Clifford was born August 5, 1863. 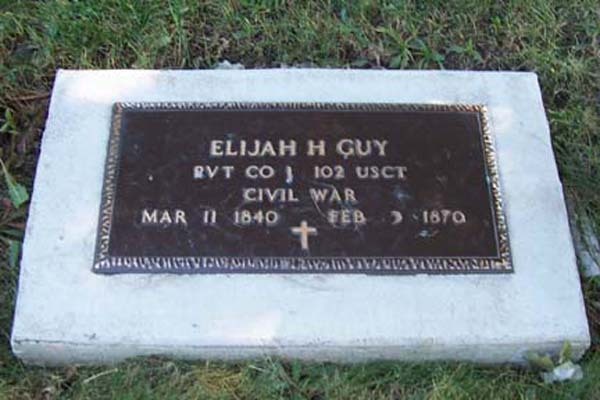 On August 31, 1864 Elijah and his brother Benjamin F. Guy age 27, enlisted as Privates in Co. 1, 102nd USCT Volunteer Infantry in Grand Rapids. During the one-year he served, Elijah contracted consumption and rheumatic fever. Elijah and Benjamin were both mustered out on September 10, 1865 at Charleston, SC. they were paid and discharged in Detroit on October 17, 1865. After his discharge, Elijah returned home to his family and continued farming for the next five years. Due to conditions he suffered in the war his health failed; he died on February 3, 1870 at the age of 29 years and 23 days.